All San Antonio locals...you are invited to our first Project Hope Craft Event! We will be decorating and putting the items together for our memory boxes. I am so excited for this event and so thankful for each and every person who has donated to this project! We have received $670 in donations!! Close to $220 of that from the Sugar and Dots Project Hope Raffle! A HUGE thank you to the many shops who donated to this raffle and to Kimmie for organizing it all. Along with donations from the other blogs and shops you see on my sidebar. These women all have such sweet generous hearts and I am so, so thankful to each of them! A special thanks to all of you have helped me spread the word with guest posts, and sharing the Project Hope button. Also to each of you sweet readers, friends and family who made a donation or sent one of the lovies. We are going this week to purchase the kraft boxes and craft supplies, as well as the remaining lovies we still need. We've had around 15 donated so far. If you would still like to donate any items for the boxes, there is still time. Deadline for receiving items is the 15th. We are holding the craft event on the 10th, but I can still add items up until the 15th and then I will take all of the boxes to Threads of Love when they are all complete. 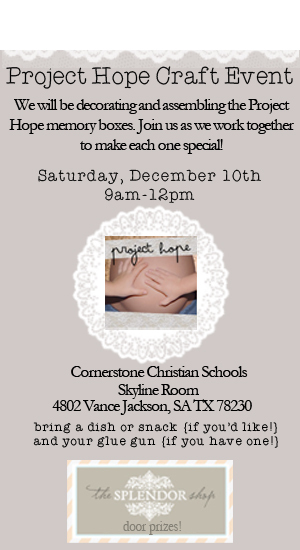 Again, if you are in San Antonio, please make plans to come help us decorate the boxes this Saturday from 9am to 12pm. This will be a fun event to connect and join our hearts together for one cause. i wish i were close so that i could help. have so much fun. so excited for you and so proud of you. wish i could be there in person. love you! wait for you to meet." I hope it went well and you had a great time! This info about You're Invited!! and a Thank YOU is very helpful for me! Thanks for giving out. it’s all very fresh and clearly written!